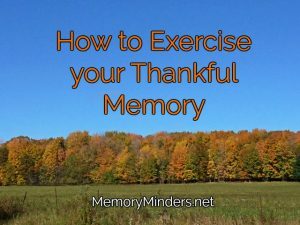 As we gather this week to give thanks, let’s also exercise our thankfulness for a healthy memory. While our memory may be sharp, we all may know someone who is struggling with theirs. Many people ask me how to approach someone who’s memory is failing. For our next installment in our month-long series on the treats of memory wellness, let’s look at how to best exercise our minds and help others to as well. There really is no one way to help a failing memory. But there are many ways to continue to strengthen anyone’s memory, as I’m sharing with you all month long. One thing we all can do is use our brain to not lose our brain. How we each do this is unique to us. But recent studies have shed some confirming light on what we’ve suspected for a while: do what you love. It will not only help memory but also our functional life as we age. Most of us don’t love challenging ourselves. So when memory begins to fade, some rise to the challenge, but many others choose to deny the issue or withdraw. The stigma of memory loss is real. It’s easier to pull back from the activities or people that challenge us. With as much as love and care as you can, gently point it out. If so desired, explain what you’ve learned here about memory wellness. Most of us feel more comfortable sharing with someone who either is in the same boat or has a suggestion to help. The best way any of us can continue to keep our mind and memory sharp is to keep using it. Do what you love by taking it to the next level and challenging yourself. If you enjoy words-find a new and stimulating word game. Love to cook? Try a new recipe or incorporating a new ingredient. Take what you already like and push yourself. But what does the person who is beginning to struggle with memory do? Maybe what they already doing is enough of a challenge. How do we help? Start first by addressing the major health or safety issues and share the concerns with a doctor for an accurate diagnosis. But don’t stop there. Everyone can keep mentally engaged, even those with memory loss. Not all mental fitness activities are for everyone. I have seen well-meaning families try to get their loved ones engaged with what they think may be helpful. But if their memory is already beginning to be compromised, some options can cause even more frustration and stress. I understand, having lived this with family and friends myself. It’s why MemoryMinders was founded in the first place. It’s why I keep trying to find new ways to keep those with early memory loss engaged. One our services may work for you or your loved one, whether it’s a group, individual or subscription option. We are here to help, even offering a gift option for the holidays. Watch for MemoryMinders Academy Holiday sale offering 25% off beginning this Friday. Gift it to your parents, loved ones or yourself for a month and see if you enjoy this unique subscription for mental fitness. Feel free to contact me with any questions. Let’s be thankful for our memory wellness and also be aware of how to help those struggling with their memory. The holidays are a time to celebrate, be thankful but also reach out to those we care about who need assistance. 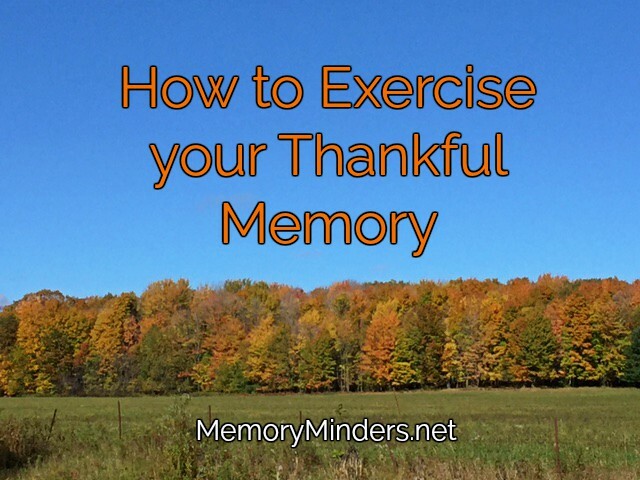 Exercise your thankful memory and help others do the same this holiday season!